Final Fantasy XIV's Heavensward expansion is out on June 23rd, but thanks to time travel or something we can watch its launch trailer now. It's a good'un, featuring all the portentous dialogue, grim villain types, giant dragons, and fiery magicsplosions you could ever want. 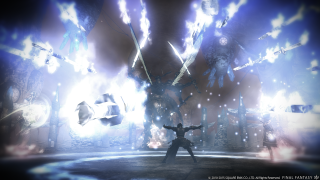 Heavensward adds a new playable race, the Au Ra, along with an increased level cap (it's been upped to 60), and three new jobs: the Astrologian, the Machinist and the Dark Knight.